Do You Know Where the Janitor's Closet Is? This morning I was told a very cool story about a lady in our church. She was talking to some people in her Neighborhood Group about being involved in the church. She was going on and on about how much she loved serving and how cool it was to be a real "part" of the Family here at Midtowne. She went on to say how much she loved the church and the people and what we are all about here. She talked about how much she loves serving and being involved and then she said, "I like knowing where the Janitor's closet is." I know that sounds like a very strange thing to say but that statement is very powerful. That statement is full of truth and conviction. That statement says more about her heart than anything else. 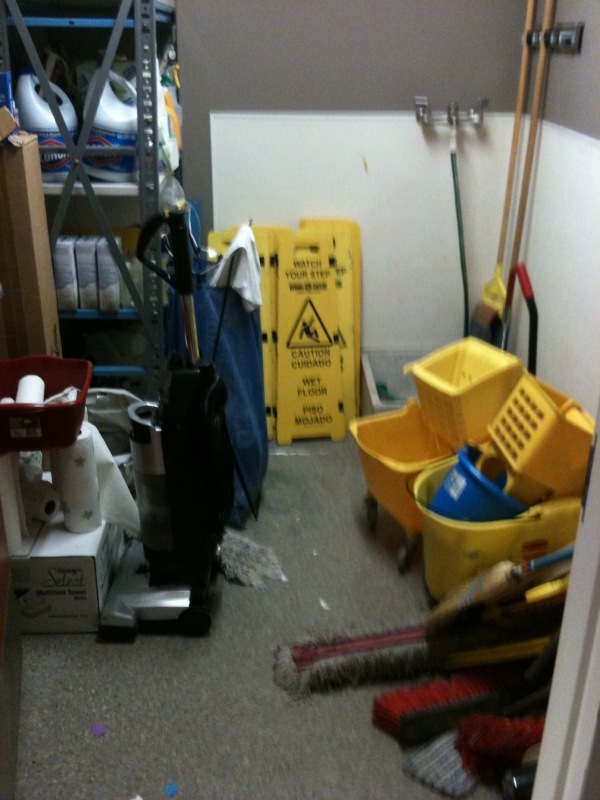 Knowing where the Janitor's closet is means that you have taken ownership in your church. It means that you have completely bought in to the mission, strategy, and philosophy of your church. You are so connected in your church that you take pride in it. Not an arrogant, sinful pride that thinks we are better than everyone else. But a pride that says you want to give your best in order to help others get in on God's Best. When you know where the Janitor's closet is, you are ready and willing to serve and do whatever it takes to help others get in on what God is doing. You are willing to do the dirty work if necessary. You are not afraid to get your hands dirty and do whatever is needed to make the building ready for our guests. You are willing to go above and beyond what is expected and help make sure that everything is done in order to help others feel welcome, connected, and important. All of those things are vital as we try to help others experience God's Best in their life. The Janitor's closet is not a great place to be in but it is a great place to begin. Look for ways to serve in your church and don't be afraid to do the jobs no one else wants to do. Being on the inside does not mean having all the answers. It means doing your part. Getting involved and taking ownership and having pride in something will help you connect, grow, and be fulfilled. Easter was amazing! God showed up in a huge way in both of our services, and so did a ton of people. We had the largest attendance we have had in our short, two-year life. We saw 5 people baptized, very cool. And 14 people gave their life to Jesus and accepted His Love into their heart! That was the best part of all. We always ask, "So what?" when we are done with our services but today I want to ask a different question. Easter is over. For all of us who serve in some capacity around here, it was the biggest day of the year. We worked very hard praying, preparing, planning, and pulling off what turned out to be a huge day. The tendency after a huge "event" like Easter is to lay back a little and enjoy the fruit of your labor. Like when you finish a big project at work or around the house or finish a big event or production at school. It's good to relax and enjoy what you have accomplished. However, I was reminded in staff meeting this week that we cannot afford to do that. Instead of sitting back and relaxing after a great Easter celebration, it is imperative that we strive for more of God's Best. I believe every week at Midtowne should be a "big" week. I believe every week at your church should be a big week. We should give our very best each and every week so that we can get in on God's Best each and every week. I also believe that we should not ask God to repeat what He did. I think that is too easy. In his book Crazy Love, Francis Chan talks about an experience he had with a young lady on a worship team. Her prayer after and amazing night of worship want not, "God, do it again." Instead, she prayed, "God, do something bigger and better." What a great attitude! One that I think we should all strive for in our walk with God. The Now What is this. Don't live in the victories and accomplishments of your past. Press ahead for more of God's Best. That is just what the Apostle Paul was saying in Philippians 3:12-14 NLT. I don’t mean to say that I have already achieved these things or that I have already reached perfection. But I press on to possess that perfection for which Christ Jesus first possessed me. No, dear brothers and sisters, I have not achieved it, but I focus on this one thing: Forgetting the past and looking forward to what lies ahead, I press on to reach the end of the race and receive the heavenly prize for which God, through Christ Jesus, is calling us. Don't misunderstand. I totally believe in celebrating victories and accomplishments. But when it comes to getting in on God's Best for your life, don't stop and settle. Press on for more of what He has for you. PS - for those of you who just have to have a So What, here you go. Do your part to make this week at your church as big of a deal as Easter was. Who says you can only have huge crowds and huge fun twice a year? Not God.